Pesto is an institution as far as I’m concerned, it’s without equal and very often imitated…badly. If your first experience of Pesto was out of a jar then I hope you have since changed your weird ways. Pesto, as it’s name suggests is all about the grooviness in it’s creation. It’s meant to be brought together in a mortar and pestle (pesto, pestle…see what they did there?) but don’t worry if you haven’t got one you could make it in a bath as long as you had a great big stone, or failing that a Robo Coup. In my view the best way to have Pesto is very simply with fresh homemade pasta – that’s it.but it must be said right from the get go that Pesto only is as good as the parts you whack into it….great cheese, great basil, great olive oil, great garlic, great pine nuts…after that a 4 year old can do it (someone run out and get me a 4 year old). Fresh Basil, a full bunch. 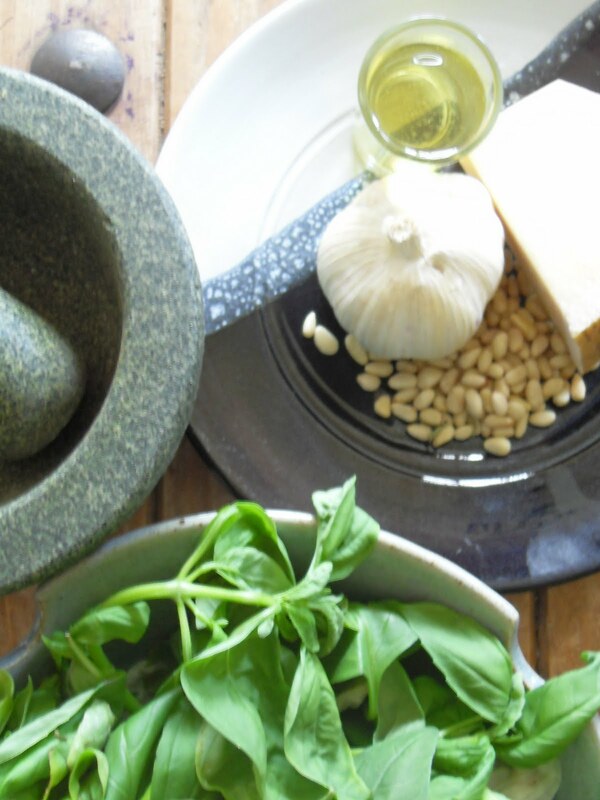 If your using the Mortar and Pestle method then run the knife through the basil, nuts and garlic to break them down a little before literally beating the lights out of them. You’ll have a fairly messy amount of green, garlic and basil scented gunk. To this begin adding the olive oil and gently bring everything together until you have a smooth if grainy consistency. The grated cheese can now be added and mixed in. Your Pesto can now be used on pasta or if you’re not using right away then jar it topped with oil and keep sealed in the fridge for a few days. Don’t hang around with Pest it likes to be used and abused as quickly as possible!! !